The most comprehensive biography of George Müller is Delighted in God by Roger Steer (1975). Müller’s own works (see below) are also a great source of information on his life, given his meticulous documentation of his activities. Other modern books on Müller include Nancy Garton, George Müller and His Orphans (1963); Bonnie Harvey, George Müller: Man of Faith (1998); and, for children, Janet and Geoff Benge, George Müller (1999). A number of biographies of Müller were written shortly after his death; the most famous is probably Arthur Tappan Pierson, George Müller of Bristol (1899). Studies of the Brethren (including both the Open and Exclusive branches) include Harold Rowdon, The Origins of the Brethren 1825–1850 (1967); F. Roy Coad, A History of the Brethren Movement (1976); James Callahan, Primitivist Piety (1996); Robert Baylis, My People (1997); Neil Dickson, Brethren in Scotland 1838–2000 (2004); Roger Shuff, Searching for the True Church (2005); Tim Grass, Gathering to His Name (2006) and Witness in Many Lands (2013); Neil Dickson and Tim Grass, eds., The Growth of the Brethren Movement (2006); and Neil Dickson and T. J. Marinello, eds., Culture, Spirituality, and the Brethren (2014) and Brethren and Mission (2016). Stories of famous leaders, authors, and missionaries associated with the Brethren movement include classics by Mary Guinness Taylor (Hudson Taylor’s daughter-in-law) The Story of the Chinese Inland Mission (1893), Hudson Taylor in Early Years (1911), and Hudson Taylor and the China Inland Mission (1918). Also check out more modern works: Elisabeth Elliot, Through Gates of Splendor (1957) and Shadow of the Almighty (2009) about Jim Elliot and A Chance to Die (2005), about Amy Carmichael; E. Schuyler English, H. A. Ironside (1976); Roger Steer, J. Hudson Taylor (1990); Patricia St. John’s autobiography, An Ordinary Woman’s Extraordinary Faith (1996) and biography of her father, Harold St. John (2011); Bob Laurent, Watchman Nee (1998); Max Weremchuk, John Nelson Darby (1993); Robert Bernard Dann, Father of Faith Missions (2004, on Groves); Jonathan Burnham, A Story of Conflict (2007, on Newton and Darby); Tim Grass, F. F. Bruce: A Life (2011); and Ian Burness, From Glasgow to Garenganze (2018). 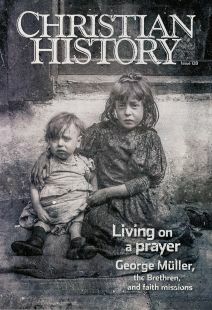 Read these past issues of Christian History online. Videos on this issue’s topic include Robber of the Cruel Streets: The Story of George Müller; Steve Saint: The Jungle Missionary; Amy Carmichael, Mother to the Motherless; and Anthony Norris Groves: The Quiet Trailblazer. CHI’s Torchlighters series includes episodes on Jim Elliot and Amy Carmichael, with George Müller due out in 2019. Müller’s Narratives and the books adapted from them—The Life of Trust and Answers to Prayer—are available online at Gutenberg.org. Mullers.org is the online site of the organization that continues to carry out Müller’s ministry; it also has a number of historical resources and photographs. GeorgeMuller.org is a Müller fan site mainly focusing on devotionals, quotations, and videos. An excellent online introduction to the Brethren is found through the Brethren Historians and Archivists Network at BrethrenHistory.org. You will find a bibliography here and also links to read articles from the Brethren Historical Review and to purchase other resources. Modern Amnesia, Did you know? Modern thinkers who have turned to the early church weren’t the first to do so. An attempt to understand a movement that has sought to combine the best aspects of evangelical and sacramental Christianity, grounded in the Bible and guided by the first few Christian centuries. Why do we need to recover from modernity?